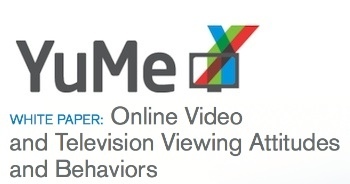 According to data in YuMe's new research report, “Online Video and Television Viewing Attitudes and Behaviors”, conducted with Frank N. Magid Associates, marketers not using online video advertising are missing out on reaching a growing audience of online viewers. The report is a random sample of 500 online video viewers across YuMe’s video ad network which found that video usage, users’ content preferences, and consumption patterns are shifting to online video and away from TV. I spoke with Mike Vorhaus, President of Magid Advisors at consumer research firm Frank N. Magid Associates, at YuMe's roadshow event in San Francisco to get an overview of the report. Vorhaus says, some very fundamental discovery was found from the data collected among the YuMe audience shows that with online video, brands could reach viewers more easily, more often and with less expense than traditional TV. Overall, online video viewing showed a dramatic rise becoming a major platform for entertainment while TV viewing is on the decline. Vorhaus notes that across the board online video viewing is up from last year and becoming part of most people's daily routine. Over the last 12 months 66% of respondents anticipated increases in online video viewing over the next 6 months and 48% in the next 12 months. This was not a generational shift either, as YuMe’s audience ranged from kids to grandparents, and compared to 12 months ago online video viewers skewed older, higher educated, single female. "We found that the online video is growing, in terms of demographics, it's becoming more mass media. So you've got older women, younger women, older men, younger men, all now involved in the online video world. You have 75% of everybody using the Internet in the United States that uses online video." YuMe believes that widespread adoption of online video for news and entertainment was brought on through the proliferation of connected devices. Online video viewing across all devices, from PCs to the iPad and smartphones, made it easy for viewers of all ages watch video content where they and wherever they wanted. Vorhaus notes that a lot people are considering online video content to be as high quality as TV and short-from "snackable" video content reigned supreme. Online viewers were also more engaged with online video ads in contrast to the multi-tasking viewers do when watching television ads, which is twice as much for TV viewers. Additionally, usage patterns indicate that consumers watch online video for the time-shifting benefits similar to how viewers use a DVR, and are not not worried about missing scheduled programs since they can watch them online whenever they want. For marketers this is a big issue because consumers skip more ads when watching TV than when watching online video. 49% of respondents skipped 75+% of ads on TV while only 29% of respondents skip 75+% of ads in online video. "You put that all together and it's pretty clear that if you're a major brand advertising on TV, there are a group of people you're going to have to reach online because they're watching very little TV." for excellence that spans multiple industries. Frank N. Magid Associates is a world leader in research-based strategy consultation. Its knowledge base is substantive, encompassing thousands |of research studies and consultation engagements. Its clients include Fortune 500 companies and leaders in their respective industries, as well as promising young companies looking to leverage the market knowledge Magid can provide to help them reach the top. Magid’s experienced professionals and operations staff serve clients around the world from offices in New York, Los Angeles, Minneapolis, Chicago, Dallas, Atlanta, San Francisco, and Marion, Iowa. YuMe is a video advertising technology company that makes professional video profitable for publishers and effective for advertisers. Its robust ACETM technology powers both its premium ad network and its industry-leading advertising management solutions, ACE for Publishers and ACE for Advertisers. YuMe’s premium ad network aggregates the best video content, representing hundreds of premium publishers. As a result, YuMe gives publishers and advertisers unprecedented reach, brand safety, contextual relevance, controlled syndication, and consistent delivery across all digital media platforms–Web, downloads, mobile, and connected TV. YuMe is a privately held company headquartered in Redwood City, CA and backed by Accel Partners, BV Capital, DAG Ventures, Khosla Ventures, Menlo Ventures and Intel Capital. For more information, visit www.yume.com, follow @yumevideo on twitter, or become a fan of YuMe on Facebook at www.facebook.com/yumevideo. To learn more, please contact getresults@yume.com.